SEATTLE (August 9, 2011)– Seattle Southside Visitor Services, the official tourism department for the cities of Tukwila, SeaTac, Kent and Des Moines, launched a newly wrapped Seattle Southside Express shuttle, which features eye-catching photos of shopping attractions and reinforces Seattle Southside’s brand. The shuttle offers visitors a free ride from SeaTac hotels to Westfield Southcenter mall in Tukwila and has gained great appreciation by the riders over the years. Since first introduced in 2005, the number of riders has been continuously growing. In 2010, the ridership increased by 22 percent compared to the previous year and the visitors who rode the shuttle spent an estimated $3.6 million on goods and services in Seattle Southside. A steady increase in ridership is expected for the year of 2011 since there have already been more than 13,000 riders and an estimated economic impact of $1.8 million in the first half of this year. The shuttle also serves as a mobile advertisement for Seattle Southside Visitor Services. 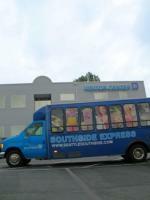 Fully funded by lodging tax dollars, Seattle Southside Express is a wonderful free service for visitors and it benefits the local economy. The shuttle travels between SeaTac hotels and Westfield Southcenter mall approximately seven times a day.